DraftFix: Who is the best quarterback in this class? It's the unanswerable question, but - come draft time - several teams, probably including the Jets, are going to have to come up with an answer. There's a handful of candidates to be high picks in this year's draft, each with things to like about them but also with some concerns. Which is the best, though? Let's attempt to rate each of the top five prospects in five key categories to try and determine which one has the best pro potential. There perhaps isn't a strong correlation between arm strength and NFL success, but we know scouts love it. Aaron Rodgers proves what a strong-armed quarterback can be capable of, but you need to be the full package to have pro success. If not, you could just end up being the next Mike Vick - or even Kyle Boller. The rest of the top five are more closely bunched together, but we have Baker Mayfield and Lamar Jackson down at the bottom as they each have a tendency to wind-up before launching a downfield throw. Josh Rosen is the best of the rest, with Sam Darnold in third. All five are in the plus category for arm strength though. Rankings: Allen 1st, Rosen 2nd, Darnold 3rd, Mayfield 4th, Jackson 5th. Allen ranks as second-best due to his innate ability to break away from tacklers. Allen is stronger than the other four candidates and can make plays with his legs or shrug off potential tacklers to extend plays and enable routes to develop. Mayfield is more athletic but often uses his scrambling abilities to set up passing opportunities. With his lack of size, he needs to use his footwork to create passing angles and does this well, although he perhaps vacates the pocket prematurely sometimes. Darnold is no slouch with his legs, racking up five rushing touchdowns this year to give him the edge over Rosen. 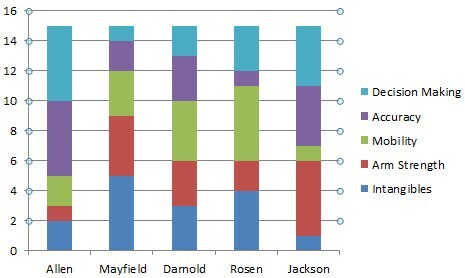 Darnold finds himself in the middle of the pack due to his lack of consistency over the course of the season, while Jackson edges out Allen for last place, having improved his accuracy over the course of his collegiate career. Allen finishes last due to his tendency to misfire on makeable throws. Mayfield gets the edge in this category. He had a variety of options and spread the ball around well on his way to a Heisman Trophy and a playoff berth. Rosen is good in this category too, although maybe his over-reliance on Jordan Lasley in the showdown against Darnold's USC suggests he might lock onto his primary target too often in the pros. Once again, Jackson and Allen find themselves down the bottom. Jackson is getting better in this area, but Allen has a tendency to force too many throws. Maybe that will improve at the next level if he's paired with some quality pass-catching weapons. Jackson is an impressive individual with outstanding character. Who can forget him emotionally thanking his mother for being his inspiration and mentor during his Heisman speech? He's worked extremely hard to improve every year at the aspects of his game that he needed to play at the pro level but lacked when he first became the starter at Louisville. Allen is also a high character individual and teams will no doubt have been impressed by how he graduated early so that he was eligible to compete in the Senior Bowl despite entering the draft as a junior. Darnold finds himself in the middle of the pack again but has no real character concerns. Each of the other five had one category where they ranked either first or last but Darnold did not, probably because of the major dip in form he suffered during the middle part of the year. This is pretty eye-opening considering how the media were trying to paint him as some kind of can't miss consensus top pick early in the year. Rosen, however, is a player who has courted controversy with some of his comments and has a reputation for having issues with his attitude and dedication. However, some have suggested he has matured over the last year.